"What about Mark Trumbo? Had a good spring. Has an opportunity. Any chance he sticks with the Angels after Morales is healthy?" "Excellent point, John. 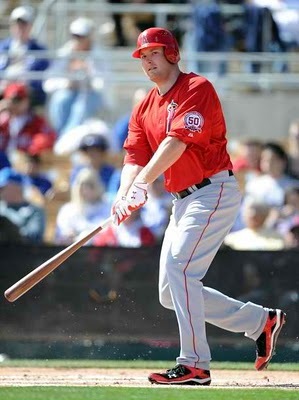 Mark Trumbo certainly looks like he deserves an opportunity. Last season in AAA he went .301/.368/.577, with 70 extra base hits (36 HR’s). It’s a good hitting environment, but doing that as a 24-year old is impressive. To answer your question, though, I don’t think he will get everyday AB’s after Morales gets back. LF, RF, 1b, and DH will be taken by Wells, Hunter, Morales, and Abreu. Maybe Trumbo will get a lot of playing time if he rotates into those four positions as the veterans get days off or have injuries of their own to deal with. Trumbo’s projections don’t jump off the page, so roster him with cautious optimism. Marcel: .253 BA, .324 OBP, 5 HR"
Finding that Trumbo is a local kid helps with rooting factor. He was a high-school kid from nearby Orange, CA, when the Angels drafted in the 18th round. The reason he was available so late in the draft is not because of questionable tools or abilities. In fact, he was an enticing dual-threat, as a player who could hit for power and pitch in the low-to-mid-90s. He wasn't selected any earlier because teams were certain that it would take a lot of money to lure Trumbo away from his commitment to a USC scholarship. Rolling the dice, the Anaheim Angels drafted and signed the kid with a $1,425,000 signing bonus. Good for them. It's always good to have truly homegrown talent on the Major League roster. It's very organic.